Wipeout is a surprisingly unique racing game. Given its initial release way back in 1995, and its cult popularity, you’d think someone would have tried to imitate its style by now. 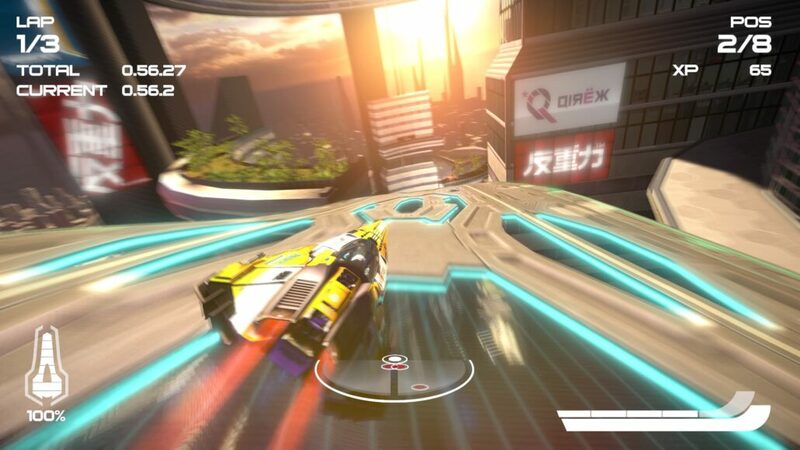 Maybe it was too hard to mimic, or maybe other developers respected the series enough to leave it alone, either way, there hasn’t been much like it, until the Wipeout Omega Collection landed on PS4. It’s strange the physical responses a game can have on you. More than just the twitching of thumbs and fingers and whatever necessary input the game requires, but the involuntary response that comes out the gameplay. I think we can all remember the times as a child we leaned with our virtual car around corners. Maybe we were trying to see over the edge of the screen, or speed up the turn, but I found myself once get leaning my physical body into nearly every turn. But the focus you need to compete in WipEout Omega’s impressive collection of race tracks is intense, and perhaps it’s that forces my body to fully immerse into the race. While racing games like Mario Kart encourage players to move between obstacles and overtake their opponents, and realistic racers like Forza teach players to follow the line that will see them through to the end the quickly, WipEout is a game of memory and reflexes. While hurtling down the track at ridiculous speeds you’ll need to memorize each speed boost, shortcut, and sharp corner to stay anywhere near the top of the leaderboard. It’s the speed boosts that require the most attention, for me at least. Coming up to particular parts of the track I would recite their placement like Ayra’s kill list: Centre, left, left, center, right, center. This normally meant I go careening into the next corner that I entirely forgot about, but I least I did it fast. And I am not kidding about the speed of Wipeout Omega Collection. Though the different classes change their name depending on the map selection, the basically breaks down to fast-ish, fast, too fast, then about two more just to make it truly impossible. Luckily for me, losing is an absolutely hilarious endeavor as I pinballed between the barriers, smashed against the shortcut divides and skillfully dodged every single powerup and speed boost possible. On top of that, breaking ahead of WipEout is surprisingly difficult, even against me, so you’ll probably find with one good lap you can move into the middle of the pack if you’ve fallen behind. This meant that the few times I was winning were especially tense, knowing that one wrong turn could drop me into last. And to help make corners just a little more thrilling, on top of the eye-watering speed, you’ll have to use L2 and R2 to assist on the sharpest turns. The thumbstick simply isn’t enough but the triggers are quite sensitive, meaning you’ll have to memorize the exact tension you used to perfect each turn as well as everything else. Unfortunately, the graphics of Wipeout Omega Collection are amazing. And I say unfortunately because they only chance you’ll have to enjoy them if you endure a terrible crash. The science fiction setting is used to full effect with bright adverts, glass coated cityscapes and impossible roads that flip and twist through densely packed buildings. Cluttered city spaces open up suddenly into beautiful vistas of the sky as the track launches upwards, before weaving down into shadowed plazas and green parks. Though most players probably only see these in passing, I, for the sack of the review, sacrificed my winning position to examine them fully. 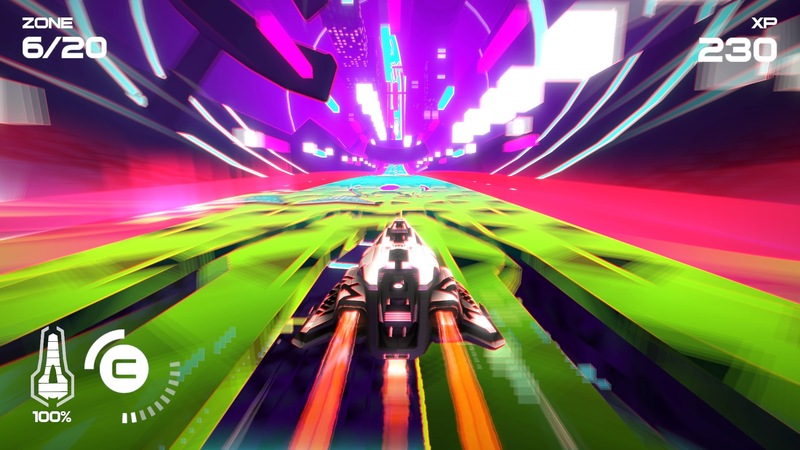 This whole game is designed with speed in mind, even if it means you might miss some of the game’s impressive visuals. The music is the right blend of sci-fi noises and thumping beat that has your heart and your head pulsing between the jolts and turns of the race. Although it does edge towards repetitive on some tracks and doesn’t have the same memorable tunes as other games, it’s a good, complimentary line-up that keeps our ears occupied as you internally scream at the impending impossible hairpin turn. I am not a racing expert. I don’t follow any real-life racing, nor do I get excited when a new shiny car is announced at E3. My racing enjoyment comes from the fun of it all. Back in the day, I played Burnout because I could push my friends into oncoming traffic, Mario Kart because blue shells were just hilarious, and Wipeout because it was the most exciting. Although without the petty bickering and tantrums, Wipeout Omega Collection proved itself to be an extremely competent racer with a huge range of tracks and ships to play with. There are hours of enjoyment to be had here, from all players who are looking for the next impossibly difficult racing game to master to those that just find amusement in how badly they can lose. Review code provided by the publisher. You can buy the game via Amazon. 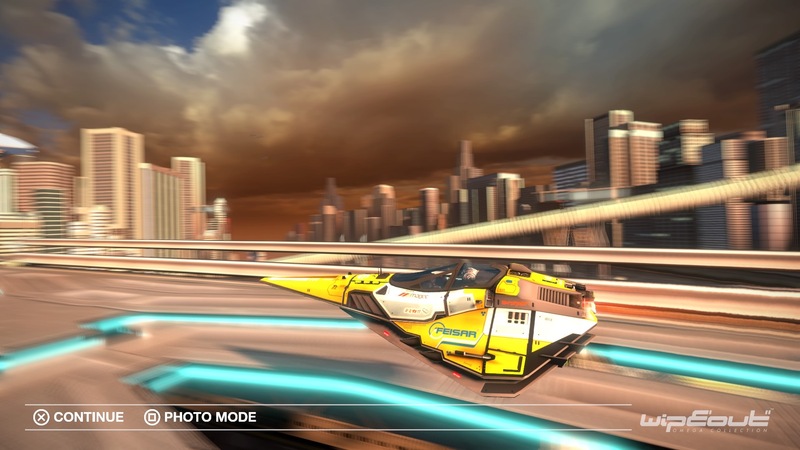 Wipeout Omega Collection offers that rare blend of arcade fun and serious racer. Fans of both can enjoy this game and there's plenty of options to make sure no one feels left out.